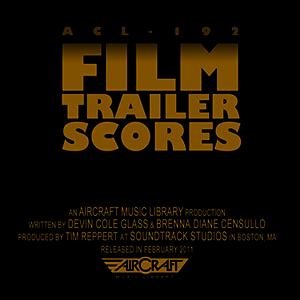 A suspenseful compilation that brings together dramatic and light pieces to create an powerful set of cinematic scores. A classical and electronic hybrid piece featuring glitch and synth sounds rock drums strings horns and aN/Abrasive lead synth. A dramatic piece book ended by a wondering piano line. Marching percussion strings and horns bring you to an unsettling breakdown with heartbeats sound effects and a harp melody. This light and rhythmic piece features marimba harp pizzicato strings and acoustic guitars. A piano interlude floats on top of synth and guitar harmonics and an oboe meanders as it leads back into an upbeat finale. Peaceful marimbas start this piece in the style of a romantic comedy. Easy going acoustic and electric guitars usher in a swell of lush strings and light drums to an uplifted finish. A fortified orchestra starts this piece with confident chord changes in the brass and strings leading into a chase like mid section. Electronic bass synths and drums drive the end of the piece to a climactic finish. In this well paced piece inspiring strings and rolling harp flow through the beginning into a reflective middle section of woodwinds finally leading to an epic finish of lush strings and powerful brass.